Concorde is a supremely bred stallion off to a great start as a sire. At present, Concorde jumps internationally under saddle of rider Eric van der Vleuten. In 1991, Concorde was fifth and sixth in Helsinki, fifth and fifth in Oslo, fifth in Nonkopin and sixth in Amsterdam. 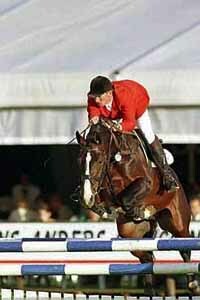 His sire, Voltaire, is well-known in the international jumping contest world. He was first in Berlin, second in Eindhoven, third in Amsterdam and third in Götheborg. In 1992, Voltaire took second place with 143 points for jumping and 135 for training. Voltaire has established his own line of top class showjumpers. Concorde's mother, Flyer, is a daughter of the legendary stallion Marco Polo, who made Holland distinguished in the field of breeding and sports. Concorde's stallion prospects appear to grow to top stallions as they age. In the Dutch five year old championships, four of his offspring were ranked in the top nine. His outstanding competition horses include Gracia, Giant, Hickory, Grace, Loncorde B, Viktor, Larone, L'Accord, Fan Holland, Larino, VDL Laroche, Jacorde, Kairos and many more.